Best budget PSU I've encountered. Silent, and has all the necessary connectors for a single gpu setup. Keeps quiet/cool, and a great value psu. This PSU is actually a bit old, and I was concerned about that a bit. However, it functions well, and I managed to tolerate the mess that are non-modular PSU's. Came with some velcro strips and wires were wrapped nicely. Just wish the wires themselves were also sleeved black instead of factory condiment colors. While being Bronze certified it is still a very solid psu with good parts in it. Its not modulair but I can just hide my cables in my case because i wont see it so no issue there. Also I haven't heard any fan noise. 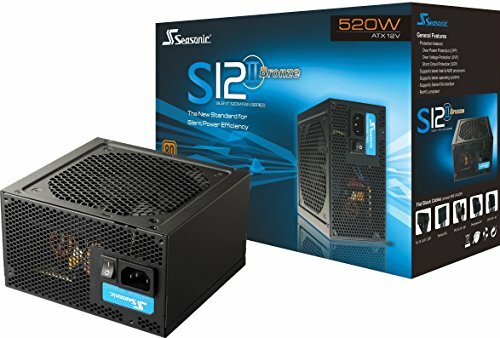 Wanted to go for a stable high quality PSU. Works good and is silent enough! It's a Seasonic. It's $60. It's tier 2 in the list. JUST GET IT. No issues. Surprisingly handles a 1070 and a 6700k.